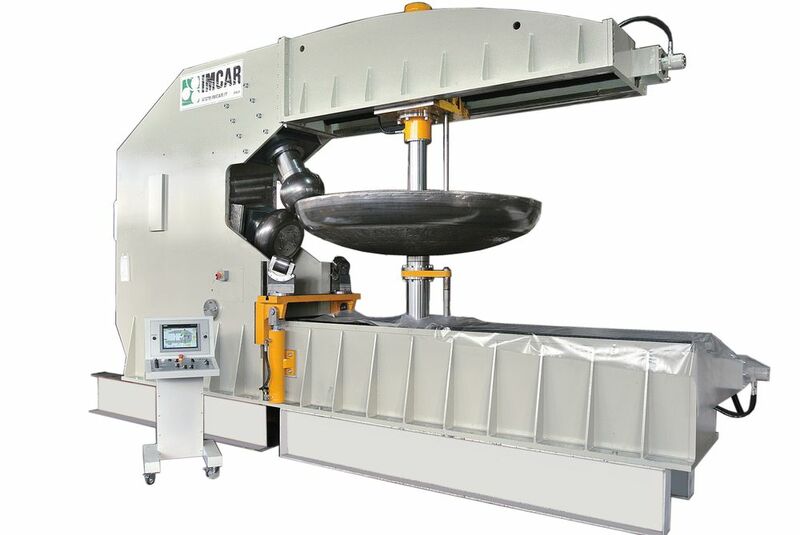 For the production of tank bottoms, Imcar proposes a line of manipulators and fixed gantry presses. 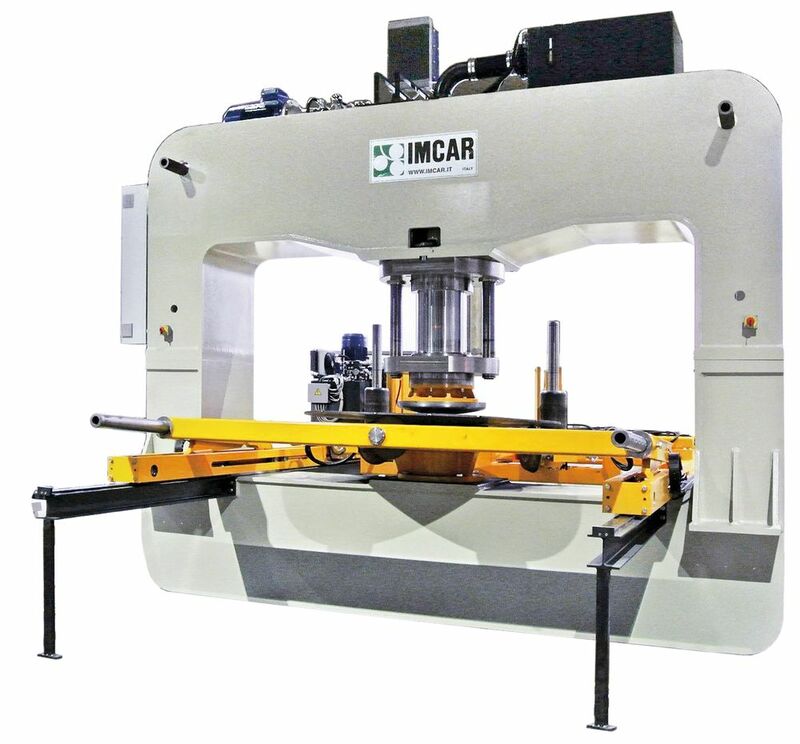 Over the years, Imcar has always been very attentive to the needs of its customers and of the market, by updating its technology and implementing cutting-edge solutions on its machines. Next to the line dedicated to the construction of tanks (Vertical Technological Installations), the company integrated a line for tank bottoms, developing a range of advanced presses, molding and flanging machines. The line for heads comprises several machines, among which the fixed gantry presses stand out. These machines are characterized by a thrust up to 1000 tonnes, but on request even models with higher capacities are available. One of the main features is the robust structure, which provides for high reliability and ability to withstand heavy use. Together with the manipulators, always Imcar production, the presses can be used for the forming of dished heads. One of the strengths of Imcar presses with manipulator their easy handling, which occurs via a single mobile control panel mounted on wheels. Here, the controls are reduced to the minimum, allowing a single operator to manage and control the functions of the press and manipulator simultaneously. The manipulator movements are perfectly synchronised with the cylinder of the machine. These movements can be simultaneous or individual, and their logic sequence determines a cycle for the execution of dished heads starting from discs of metal sheet. Among the most innovative technical solutions, the particular construction of the main thrust cylinder stands out, which provides faster work cycles while reducing production times with respect to traditional machines. Next to the press-manipulator, to optimize the production process of convex parts, Imcar has expanded the production of flanging machines. The machine can handle radiuses up to 300 mm of max. 30 mm thickness (on request, even machines for higher capacities are available). The flanging machines that handle sheets of up to 8 mm thickness can also cut and flange the discs. Whereas, for models with edge radius above 70 mm and more than 8 mm thickness, Imcar machines can only flange. Fully hydraulic, the flanging machines can process sheet steel, as well as moulded and dished heads. The operator can follow the work cycle step-by-step, controlling the movements on a single control board, by means of pressure controllers and displaying the various instructions on the touch-screen. The adjustment of the distance between the shaping roll and the flanging roll occurs through hydraulic cylinders. Thanks to this adjustment, high-quality results can be obtained, for thin and thick materials. The dished head is fixed by means of a hydraulic piston and a central hole, so that a stable bottom can be maintained during the whole edging process.